Few planes inspire more awe than the Galaxy. A comparison to a flying whale seems apt — but a fast and efficient whale that can carry two battle tanks across the Pacific Ocean in a matter of hours and on a single tank of jet fuel. Known to pilots and plane spotters as the C-5, the Galaxy was developed by Lockheed Martin in the late 1960s to ferry equipment and troops to Asia. Last week, almost exactly 50 years after the plane made its maiden voyage, Lockheed delivered the latest upgraded version, called the C-5M Super Galaxy, to the U.S. Air Force. The C-5 is the largest plane in the U.S. Air Force fleet. Lockheed has built 131 of them, each capable of carrying two 78-ton M1A1 battle tanks or a twin-rotor Chinook helicopter and other large equipment from continent to continent. According to Lockheed, a fully loaded C-5 has a gross weight of more than 800,000 pounds. Although the Galaxy is a military transport plane, it helped launch GE into the commercial aviation business. As we reported in GE Reports, the jet’s original TF39 engines used a design called a high-bypass turbofan, which placed a big fan up front to generate thrust in combination with a jet. GE had to test the engine on a B-52 bomber — the closest plane in size to the gigantic C-5. Top and above: The C-5 is the largest plane in the U.S. Air Force fleet. Images credit: Tomas Kellner for GE Reports. Today virtually every midsize and large commercial plane uses the same engine design. But back then, it was revolutionary. 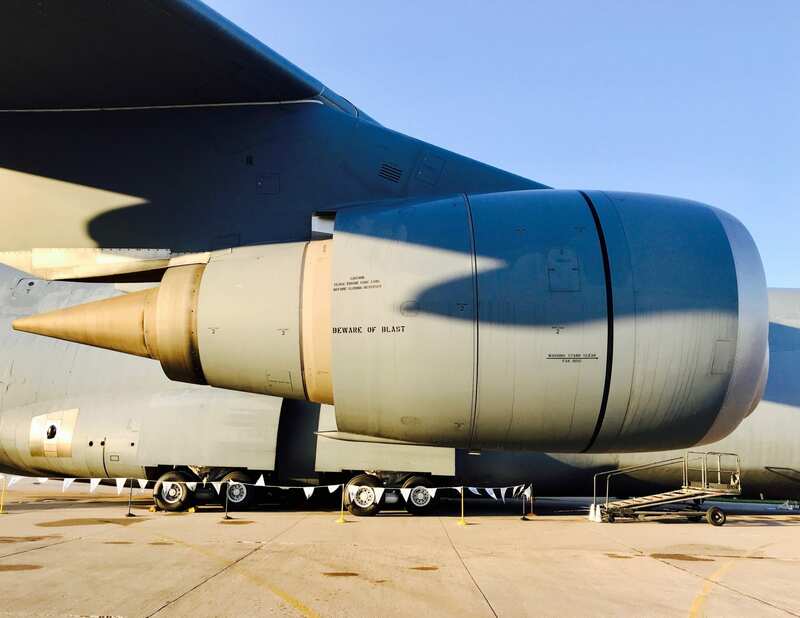 The high-bypass turbofan design allowed GE engineers to boost the engines’ thrust to 40,000 pounds each — the C-5 has four of them — and cut fuel burn by a quarter compared with other engines in use at the time. By comparison, GE’s supersonic J79 engines, which the company developed for the Phantom a decade before, had just 17,800 pounds of thrust. GE quickly saw the commercial potential of the turbofan engine and built a passenger version called the CF6. Launched in 1971, it’s one of the most common jet engines in the world today, powering all makes of planes, from Boeing 747 jumbos — like the president’s Air Force One — to Airbus long-haul jets and Beluga cargo lifters. GE has delivered more than 7,000 of the engines to 250 airlines in 87 countries. The newest versions are expected to fly until 2040. In fact, the upgraded version of the C-5, the Super Galaxy, is now also using the same propulsion. In 2006, the Air Force decided to retrofit 52 of the planes with the engines and more than 70 other technology upgrades. The new military version of the CF6 engine alone, called GE F138, provides 50,000 pounds of thrust — a fifth more than the TF39, the original turbofan engine — and allows the plane to meet new noise-reduction requirements. Other benefits include a shorter takeoff, a 58 percent improvement in climb rate and “greatly enhanced fuel efficiency,” which means less reliance on air tankers, according to Lockheed. In 2006, the Air Force decided to retrofit 52 of the planes with the engines and more than 70 other technology upgrades. The new military version of the CF6 engine alone, called GE F138, provides 50,000 pounds of thrust — a fifth more than the TF39, the original turbofan engine — and allows the plane to meet new noise-reduction requirements. Image credit: Tomas Kellner for GE Reports. But the GE turbofan’s evolution didn’t stop with the CF6. Engineers built on their knowledge to design the GE90, the world’s most powerful engine, which boasts thrusts of up to 127,500 pounds; the GEnx for the Boeing Dreamliner and 747-8 jumbo; and the GE9X, the world’s largest engine, which was developed for Boeing’s next-generation 777X plane. New materials such as carbon fiber composites and ceramics, plus new technologies like 3D printing, reduced the weight of the engines by hundreds of pounds, boosted thrust and further improved fuel efficiency. The latest engines like the GE9X and the LEAP engine, developed by CFM International — a joint venture between GE and France’s Safran Aircraft Engines — use all three manufacturing advancements. The LEAP engine is the fastest-selling engine in aviation history. CFM has received orders and commitments for more than 15,500 LEAP engines, at a value of more than $220 billion. Workers must crank out 2,000 LEAP engines per year by 2020 to meet demand as they plow through a seven-year backlog. 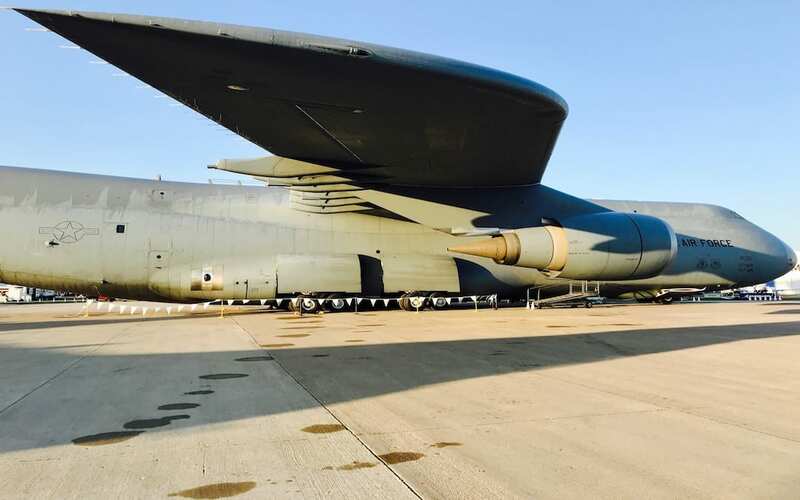 GE Reports visited a C-5M Super Galaxy at Travis Air Force Base in California last month at the EAA AirVenture Oshkosh airshow. Take a look at what we found. 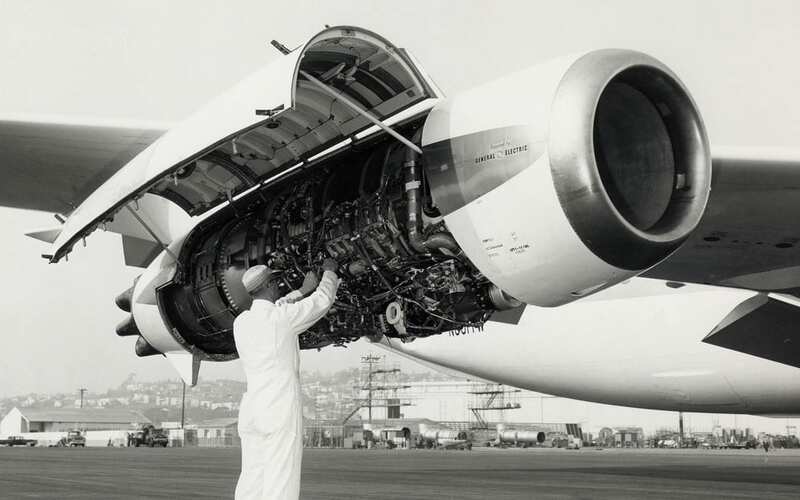 Today, virtually every midsize and large commercial plane uses the same engine design, but back in the 1960s, it was revolutionary. Image credit: Tomas Kellner for GE Reports. Launched in 1971, the CF6 is one of the most common jet engines in the world today, powering all makes of planes, from Boeing 747 jumbos — like the president’s Air Force One — to Airbus long-haul jets and Beluga cargo lifters. Image credit: Tomas Kellner for GE Reports. A comparison to a flying whale seems apt — but a fast and efficient whale that can carry two battle tanks across the Pacific Ocean in a matter of hours and on a single tank of jet fuel. Image credit: Tomas Kellner for GE Reports. One amazing aircraft! During my Air Force career my installation had 16 based there. Trans continental flights during operation desert storm and operation enduring freedom, delivering supplies, equipment and personnel. Just amazing! I recall facing the rear of the aircraft looking down into the cargo hold. It was a smooth ride. If memory serves me correct, we unloaded 4 5000 gallon R9 refueling trucks off a C5 at Misawa AB, Japan in 1985. It was a treat to drive then out the back! At one time, we built a Fuel Savings Advisory System (FSAS) for the C5/C141 aircraft. It was quite the marvel for the time. One Flight program serviced both aircraft. Coupled to the Auto Throttle/Auto Pilot system, provided Time of Arrival and saved fuel too. Fuel savings in this beast can be enormous. I got to fly jump seat when testing out the heavyweight wing modifications, a/c GW approached 1,000,000 lbs. Amazing.